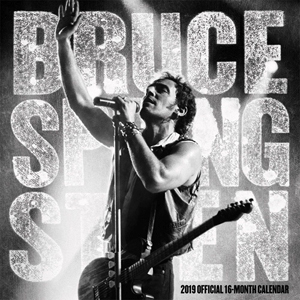 Official Springsteen calendar for the new year is in stock now, and 1/3 off! This official 2019 Springsteen calendar from Thrill Hill Productions features the work of various photographers, with a focus on the '80s and '90s to coincide with this year's Album Collection Vol. 2 box set. 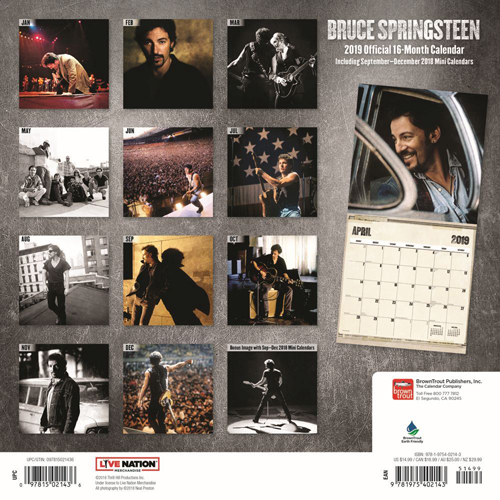 Each month of 2019 features a large image (12" x 12"), of Bruce Springsteen on and off stage, with and without the E Street Band (see the back of the calendar below for a look at each month). Like previous Thrill Hill calendars, this Bruce-licensed 2019 model is high quality on glossy stock and very useful, with space to write for each date and major holidays marked. An 18-month calendar, it can be used immediately as it starts with September - December 2018 on the opening spread.